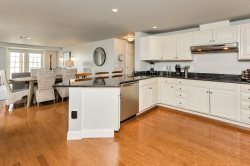 This fabulously renovated and furnished cottage style home on Foreside Road in Falmouth Foreside exudes charm. The home abuts over 8 acres of beautiful park and walking trails, yet is only minutes to Downtown Portland. Two levels of living offer comfortable accommodations for up to 6. Main level offers a living room, custom chef's kitchen with granite counters, stainless steel appliances, and dining area, as well as a butler's pantry and powder room. This level has been thoughtfully designed offering beautiful spaces for all to enjoy. Living room boasts seating for 4+, a fireplace, and tv tucked in to be available but not over take the room. A private brick terrace off the back of the house offers abundant outdoor dining and seating. Home offers a private driveway and highly sought after spacious 1 car garage. Second level offers master suite with king bed and designer quality master bathroom. Gorgeous marble shower with glass enclosure and large marble vanity finish out the beautiful room. Two additional bedrooms offering queen size beds and shared bathroom and laundry.